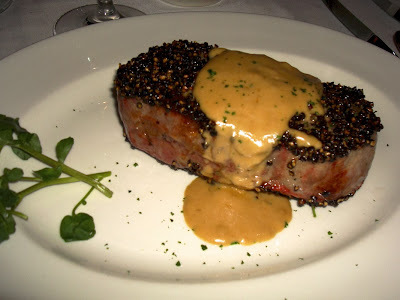 This one of my absolute favorites, as it combines the wonderful flavor of beef, with the perfect compliment of copious amounts of cracked black pepper. There are few points, which must be followed, to ensure that this dish is ideal. Firstly, I recommend that you use a sauté pan, which can go from stove top directly to the oven. This is the best way to guarantee the flavors stays in the steak and keeps the meat moist. Secondly, you must use freshly crushed black pepper and not ground pepper. If you use ground pepper the end result is over powering. Preheat your oven to 500 degrees. Put your pan onto the stove and preheat until it is very hot. Once it is ready, salt the meat and then roll it in the freshly crushed black pepper. Make sure it is completely coated. The easiest way to make the crushed pepper, is to put the whole peppercorns in a plastic bag or wrapped in a cloth and pound it with a mallet or a rolling pin. Add the oil and when it is smoking, gently lay the meat into the pan and sear on both sides, about 2 to 3 minutes per side. Then transfer the entire pan into the preheated oven. The timing with depend on your preference, but it will be best either rare or medium rare. Approx. 7 to 8 minutes for medium rare. Remove the pan from the oven and set the meat onto a cutting board or dish and cover with aluminum foil to rest. Put the pan onto the stovetop and add your shallots and sauté lightly, then pour in your cognac and deglaze the pan. You may flame the cognac if you desire. Once the alcohol has cooked away, add your heavy cream and bring to a soft boil and reduce until a sauce texture is obtained. A good way to check a sauce, is to see if it will coat the back of a spoon. If it coats the spoon, it is perfect. Plate the steak then finish with the sauce and serve immediately. Oven roasted potatoes or french fries are a good accompaniment to this dish.